My Venice friend Sally and I just zoomed down to Atlanta to take in the drag races for her birthday. That's all she wanted to do, and I'm always game for something new, so off we went, for less than 48 hours. Which was plenty of time for me to realize that a lot of Georgia seems to be all about the races ... both auto and genetics. Whoa. We live in quite a bubble here in Venice and you really do forget just how real all the race stuff is in other places. It's downright shocking, actually. The NHRA drag race nationals were on in a town called Commerce, Georgia, about an hour outside of Atlanta. I know absolutely nothing about this sport. The nice thing about things like this is that everyone around you wants to teach you and be the expert, which I was happy to let them be. But when the crowd roared extra loud for a car that pulled up to the starting line, I asked the lady next to me what the deal was. She said, "Oh, he's one of the best right now, and can you believe he's BLACK?!" I almost fell off the bleachers. Before I knew it, I'd replied, "Oh, so is my husband." (He's not. I don't currently have one. But he could be.) Because I didn't want to be shocked alone. Her response? After a searching pause, "Well, I think it's nice that he drives a white car." Yep. Gross. I've never heard anything louder than the approximately 3 seconds that it takes for the car to fly by, and that was with ear cans on. People loved it, black and white. Imagine! It was also very green there, as it rained on and off the whole time, and Hotlanta was actually freezing. But Pat Sajack says climate change believers are "Unpatriotic racists," so I don't want to be that. I bet many at these races would have agreed with sad, misguided Pat though. Still?! In 2014?! I guess so. We got back to the city later than planned, and as our hotel was downtown, not much was open. The concierge recommended a Mexican place next door, but you don't come from Los Angeles to Georgia to eat Mexican. She then rather stiffly said that there was a place across the street that was still open, but "They just serve typical Southern food." Perfect. I'm going. Sweet Georgia's Juke Joint is a place fashioned after The Color Purple, with the food and drinks named after characters from the film, like "Miss Celie's Punch." I can assure you that I was the only Norwegian in there celebrating the Motherland's Bicentennial that very day. There was a 2 hour wait, unless you could find a seat at the bar, I was told in a tone like "Good luck, white girl." In fact, I was called White Girl quite a few times in there. It was odd to feel like such a sore thumb sticking out, but I'm here to build bridges, and undaunted, I saw two guys sitting at a four top. I thought it might be nice if they scooted over so we could share the spot, as there were no other options. They were gracious and let us sit down, but I could tell the ladies at the next table were absolutely not thrilled. I was going to win them over. 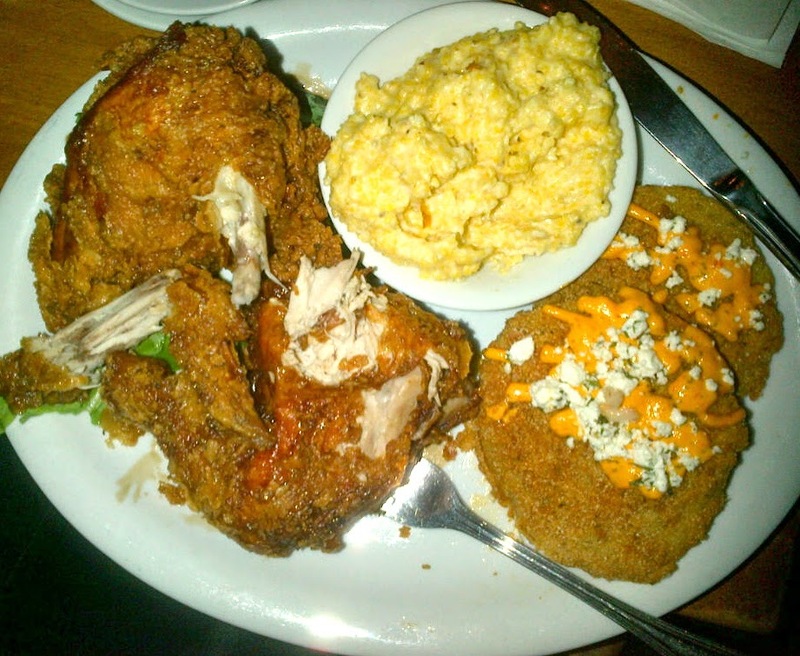 After a complete blast of a time, eating fried chicken, cheese grits and fried green tomatoes, having the owner buy us shots of blackberry moonshine (! ), serious chats about why someone would say, "They don't want the black guy in the picture" in this day and age, making friends with our great server, Toi (who makes purple bottomed high heels!) and finding out that the guy next to Sally was actually in charge of parking enforcement for Venice (!!! ), well, by the time we left, there were hugs all around, emails exchanged and it felt like maybe some actual progress in the world ... if a bit alcohol induced. 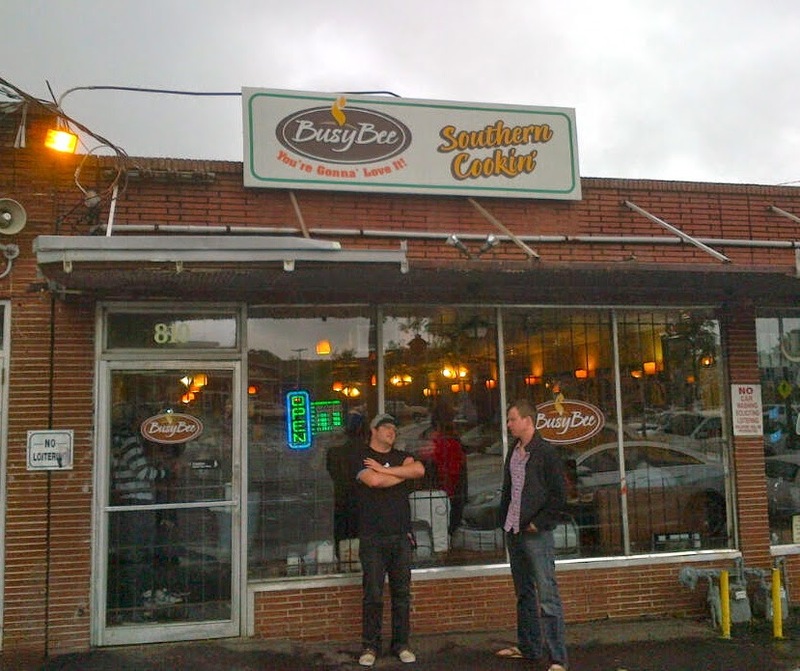 The drag races were rained out on Sunday, forcing us to seek out solace with more fried chicken at what my Georgia-born and bred friend, Brian Dunsmoor, told me was the very best place for real deal Southern cookin' - The Busy Bee. 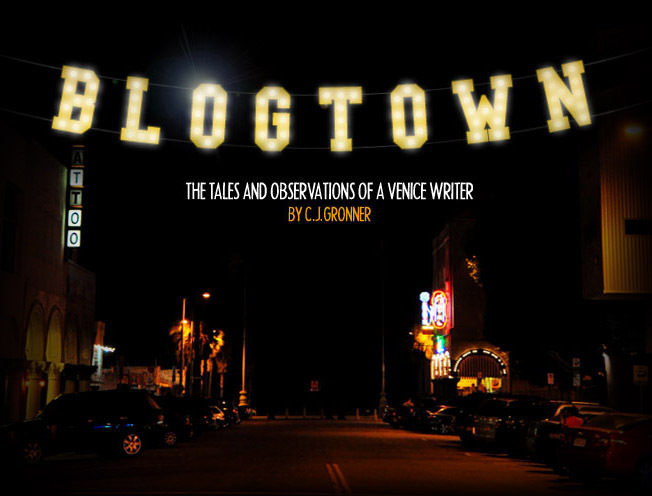 Again, when I asked the concierge about it, she majorly hesitated, and said, "It's a bit ... Urban." Herself being "Urban". She said it was the kind of place where we'd leave smelling like it, a hole in the wall. Again - Perfect. I like legit. I believe I was the first person ever staying at the Ritz-Carlton Atlanta to ask for directions to The Busy Bee. The staff all had a conference about sending me there, truly not thinking it was safe. I only care if my presence would offend someone else by being there, and that's it. I live in Venice, where you could get smashed in the head with a skateboard for $20 by someone to buy their meth, and I ride my bike right by. You don't bother me, I don't bother you style. I'm not scared, and made that clear. I finally got the very sweet and kindly concerned concierge's blessing only when I said I'd email or call her to tell her I was fine. Which I did. I was SO fine ... It truly was the very best fried chicken I've ever had. The people were wonderful in the tiny, packed for Sunday supper and every college graduate in town's lunch, where I was again the only (natural) blonde. There was an armed policeman standing behind the bustling, cramped counter where we sat, but he seemed unnecessary. We ate til we couldn't move, and our massive thing of leftovers was later given to a stoked homeless man. We again left with hugs, and this time, some peach cobbler for the plane ride back to Venice. Even after such a short, whirlwind weekend, it's still always a true pleasure to come back to Venice (Hey, even from Hollywood! ), where yeah, maybe it's a bubble, but it's one I want to live in. Freedom. Love. Acceptance. Creativity. Go wherever you want without thinking about it. Color blindness (I'd like to think). But it's really good to venture out and spread it around a bit when you can ... A lot of the rest of the country can certainly use a dose of all that. But I'll give them the fried chicken.